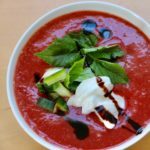 What do cucumbers, strawberries and rhubarb have in common? Yes, two of them are vegetables smarty pants. But when the three of them meet together with a touch of chocolate balsamic vinegar they become the makings of a very memorable fresh summery soup. 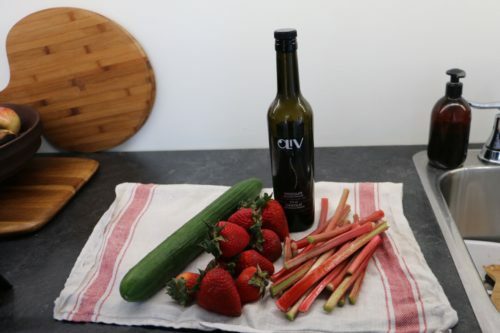 This time of year we still depend on imported strawberries which tend to be large and watery and since chilling mutes flavours you may want to add a touch more salt, a dash more of balsamic vinegar or maybe even a pinch of sugar. Perfectly refreshing and ideal as a starter for your next barbecue or as a super easy light meal all on its own. And soup for breakfast? Why not? Peel the rest of the cucumber and chop. Add rhubarb, chopped peeled cucumber, strawberries and blasamic vinegar to a bowl and with an immersion blend, blend until smooth. A regualar counter top blender is fine for this too. Ladle into bowls. Add a dollop of yogurt and sprinkling of diced reserved cucumber. Finally add a grind of black pepper and serve. Thanks to the Washington Post for the inspiration.